The Global Volcanism Program has no activity reports for Boisa. The Global Volcanism Program has no Weekly Reports available for Boisa. The Global Volcanism Program has no Bulletin Reports available for Boisa. The small, 1.4 x 1.7 km Boisa, or Aris Island consists of a large basaltic-andesitic cone with a summit crater open to the north whose rim extends to the island's east coast. The crater of the basaltic older cone is filled by two steep-sided andesitic lava domes, the highest of which forms the 240-m high point of the island. A third lava dome, separated from the eastern cone by a low saddle, forms a peninsula on the western side of the island. No historical eruptions or present-day thermal activity have been observed, although the last eruption may have been quite recent judging by the youthful morphology of the island (Gust and Johnson, 1981). Gust D A, Johnson R W, 1981. Amphibole-bearing inclusions from Boisa Island, Papua New Guinea: evaluation of the role of fractional crystallization in an andesitic volcano. J Geol, 89: 219-232. Johnson R W, 1993. (pers. comm.). The Global Volcanism Program is not aware of any Holocene eruptions from Boisa. If this volcano has had large eruptions (VEI >= 4) prior to 10,000 years ago, information might be found on the Boisa page in the LaMEVE (Large Magnitude Explosive Volcanic Eruptions) database, a part of the Volcano Global Risk Identification and Analysis Project (VOGRIPA). There is no Deformation History data available for Boisa. There is no Emissions History data available for Boisa. 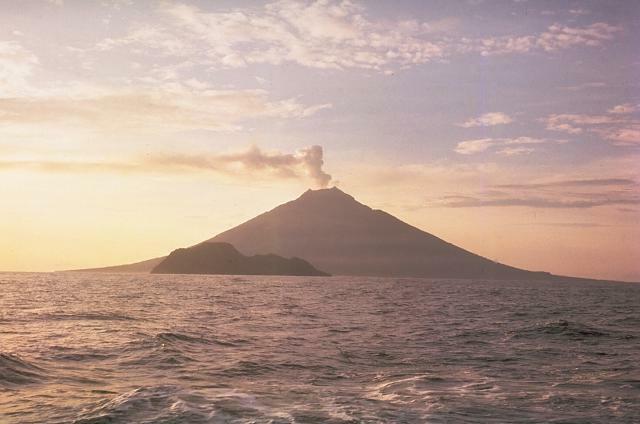 The small, 1.4 x 1.7 Boisa Island is seen here in the foreground from the west with steaming Manam volcano in the distance. Boisa volcano consists of a large cone with a summit crater open to the north whose rim extends to the east coast. The crater of the topographically indistinct stratovolcano is filled by two steep-sided lava domes, the largest of which (left) forms the 240-m high point of the island. No historical eruptions have been observed from Boisa, in contrast to Manam, which is one of Papua New Guinea's most active volcanoes. Photo by Tony Taylor, 1963 (courtesy of Wally Johnson, Australia Bureau of Mineral Resources). There are no samples for Boisa in the Smithsonian's NMNH Department of Mineral Sciences Rock and Ore collection. Large Eruptions of Boisa Information about large Quaternary eruptions (VEI >= 4) is cataloged in the Large Magnitude Explosive Volcanic Eruptions (LaMEVE) database of the Volcano Global Risk Identification and Analysis Project (VOGRIPA).